New! Leather cap! The sexiest propeller cap on the planet! Today's comic features Solid Nitrozanium SuperFan GMx! 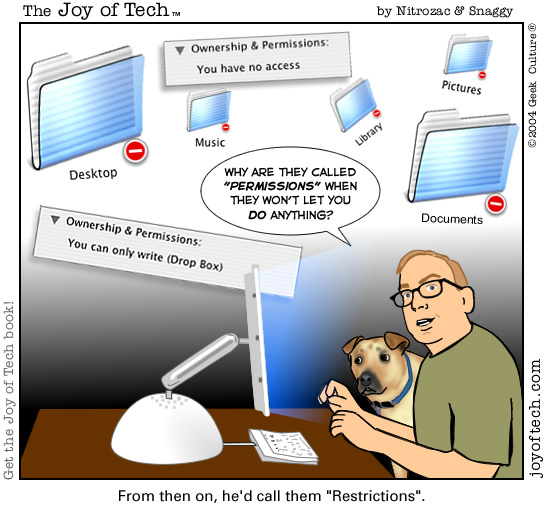 What do you think of Permissions? I've given myself permission to like them. I miss those old wild and free permission-less days. I'm an Admin... Permissions = POWER. SupportGoddess starts Chain Story: The Resurrection , and publishes What Book are You? ... GeneL wonders if ACT for Mac be adapted to synch with a PDA? , ... Sephiroth hates thinking of subjects , ... mlcillo seeks a Galactic trader , ... and Lumina Manson asks us to Name her kittens! And in SuperFan Clubhouse Tidbits ... Kerry gets Nitrozac'd! ... and GMx too! and Xanthine steams it up with Does dragonman97 need a cold shower?